With the 43rd Annual San Diego Comic-Con International kicking off later this week, many movie studios are getting their stars, movie trailers, and promotional materials ready to win over attendees of the massive pop culture convention. This year fans will get the opportunity to watch exclusive materials and to meet their favorite celebrities from upcoming science fiction films like Dawn of the Planet of the Apes, The World’s End, and Alfonso Cuarón’s Gravity. Legendary Pictures and Warner Bros. are planning to make a big splash with their upcoming Godzilla reboot, and now director Gareth Edwards is teasing fans with what they should expect to see in San Diego this year. I’m still coasting on a high from last night’s Pacific Rim showing, not to mention picking over my schedule to try and figure out when I have the time to go see it for the second time. If you haven’t seen Pacific Rim yet, but plan to, you might want to use the excuse to engage in a time-honored tradition of movie fans everywhere: the double feature. Since we here at GFR love you all and want to make your life as stress-free as possible, we’ve already done the legwork for you. That’s just how we are. Scroll on down for five excellent candidates for your Pacific Rim double feature. Godzilla Viral Marketing Campaign Begins! With the start of San Diego Comic-Con next week, Legendary Pictures and Warner Bros. are kicking off their viral marketing campaign for the new Godzilla reboot. The film will hit theaters in less than a year, but so far the marketing campaign hasn’t really kicked into full gear. 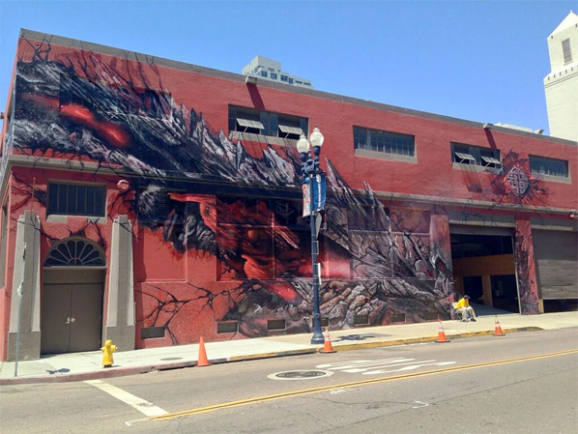 Legendary will change that at Comic-Con, having recently converted a San Diego warehouse to look like it had been through a Godzilla attack. 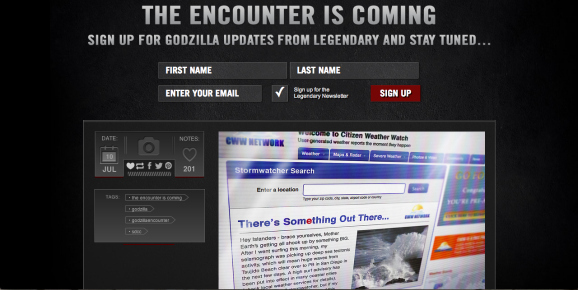 And with the release of Pacific Rim this weekend, it’s the perfect time for Legendary Pictures and Warner Bros. to launch Godzilla‘s viral marketing campaign with GodzillaEncounter.com. Godzilla Encounter is a tumblr. page Legendary Pictures set up to feature mysterious encounters with the giant, radioactive sea monster. With the headline “The Encounter Is Coming” and a forum field to sign up for a Godzilla newsletter, it seems like Legendary Pictures is counting down to something they might be revealing in Hall H during San Diego Comic Con, perhaps the film’s first teaser trailer. It would be good to see some actual footage from the Godzilla reboot, and Comic-Con is just about the perfect place to do so. Now that the massive monsters of Pacific Rim have crashed down upon movie audiences like a thunderous force of nature, we can turn our attention to the next large-scale creature feature on the horizon, Gareth Edwards’ Godzilla. The production has been stomping around Vancouver, B.C., for some time, and now the production has taken something of a working vacation, moving their primary base of operations to Hawaii. A local TV station has the first look at the tropical set. KITV, a local ABC affiliate, stopped by the Waikiki set to poke around, check out the scenery, and interview random passersby. One man they spoke to had no idea there was a movie shoot in town, and you can imagine his initial surprise when he came across a half acre stretch of beach that looked like it had been pummeled by a radioactive, lizard wrecking ball. Approximately 20% of the film will take place in the Aloha State. With about 10 months before the new Godzilla reboot starts stomping into theaters, Legendary Pictures and Warner Bros. are already starting to promote the new film. One of the biggest surprises from Legendary’s panel during last year’s San Diego Comic-Con was the brief presentation of Godzilla. 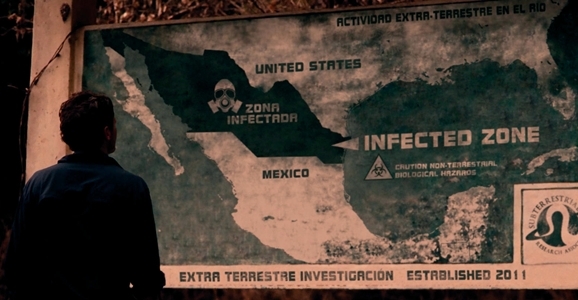 Although Godzilla isn’t scheduled for an appearance in the Con’s massive Hall H, Legendary took the opportunity to introduce Gareth Edwards as the film’s new director, reveal a new poster and logo, and showcase a short sizzle reel that captured the dark and gritty tone of the new monster movie. Since Legendary Pictures and Godzilla were a highlight of last year, they will be doubling their efforts and presence for this year’s Comic-Con. According to El Mayimbe from Latino Review, Legendary Pictures is planning a Godzilla event for Comic-Con’s preview night on Wednesday, July 17. Apparently, they’re planning on having Godzilla himself emerge from the ocean in the bay near Hall H. Already, Legendary Pictures has been converting a warehouse to resemble a battered and beaten building with a few noticeable battle scars from Godzilla.